The lowsider or lowside is a type of motorcycle crash usually occurring in a turn. It's caused when either the front or rear wheel slides out as a result of either too much braking into the corner, too much acceleration through or out of the corner, or too much speed carried into or through the corner for the available grip. It may also be caused by unexpected slippery or loose material (such as oil, water, dirt or gravel) on the road surface. 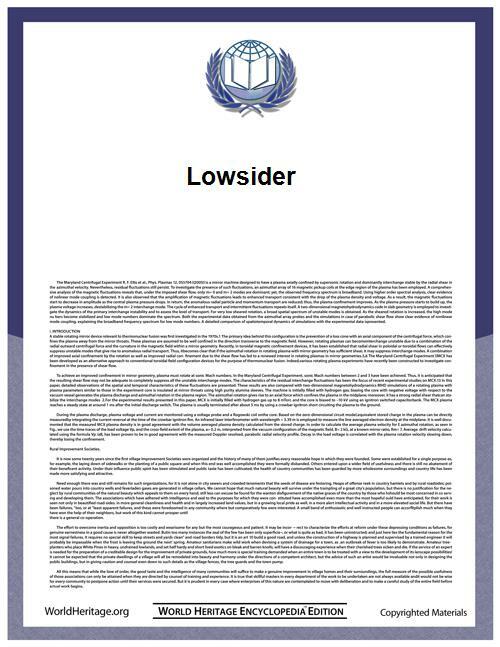 In the United Kingdom, Canada, New Zealand and Australia it is referred to as a "lowside" rather than a "lowsider". All forces occurring between the motorcycle and the road (such as accelerating, decelerating and steering) are transmitted by friction occurring in the contact patch. There is a limited amount of force the contact patch can transmit before the tire begins to slide. Typically, the forces reduce slightly upon sliding. When travelling in a curve, the tires provide the centripetal force needed for the acceleration towards the center of the curve. The capsizing moment provided by the motorcycle's lean into the corner is in moment equilibrium with the centripetal forces at the ground when all is working correctly. If, having reached a given lean angle, the centripetal forces are reduced then the motorcycle increases its angle of lean until it touches the road surface, usually unseating the rider in the process. Rapid deflation of one of the tires causes grip levels to reduce. Lowside crashes do not usually occur through braking in a straight line in dry conditions. It's more likely that the rider will go over the handlebars through too much front wheel brake force or will lock the rear wheel resulting in a straight skid. The name derives from the fact that it is the inward side the motorcycle will fall on (or the side that points downward in a curve, the low side), therefore some turning must be occurring for it to happen. A rider braking in a straight line on a cambered road could still experience a lowside crash if either of the wheels lock through braking as the bike will slide sideways with gravity down the camber. Riders are usually advised to do a lowsider rather than a highsider if neither can be avoided. The lowsider has the advantage of the motorcycle sliding before the rider, thus not threatening to crush him or her. Also, a lowsider tends to send the rider sliding across the road whereas a highsider is considered more severe as it violently throws the rider from the motorcycle with a higher probability of broken bones. ^ "Highside and lowside crashes explained". Retrieved 2014-10-15.